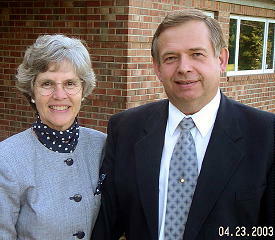 Beverly and I serve in the ministry of the United Church of God. We live in Indianapolis, Indiana and pastor churches in Lafayette and Terre Haute, Indiana. I am also Operation Manager for Ministerial and Member Services for the United Church of God as well as senior pastor for Eastern Europe, Scandinavia, Malawi and Zambia. I was born October 3, 1947 in Hannover, Germany, in a United Nations refugee camp, in the aftermath of World War II. I emigrated to the United States with my parents in 1949 and became a naturalized citizen of the United States. My educational experience includes attending the University of Minnesota and then Ambassador College in Pasadena, California. I graduated from the Bricket Wood, England campus of Ambassador College in 1969 with a Bachelor of Arts degree. Since 1969 I've served in the ministry of the Worldwide Church of God starting in Sioux Falls, South Dakota church. My career took me to congregations in Rapid City, South Dakota, Minneapolis, Minnesota, Paducah, Kentucky and then back to Minneapolis. In 1990 I was appointed assistant director of Church Administration for the Worldwide Church of God and worked from their world headquarters in Pasadena, California. My special interest was in evangelism, especially being concerned with what local congregations could do to further the gospel. I regularly contributed articles for the churchs various publications. For the churchs Youth magazine I wrote a question and answer column for over three years. In April of 1995 I helped with the founding of the United Church of God which is now based in Cincinnati, Ohio. I served on the transitional board and directed Ministerial Services until December 31, 1995 and have served on the Council of Elders until May 2011. I speak fluent Ukrainian, also Russian and have traveled extensively around the world, particularly in Eastern Europe. I have developed contacts with broadcast management in St. Petersburg, Russia and currently doing humanitarian work in Ukraine, Malawi, Zambia and other places. I have worked with emerging religious groups in western Ukraine to which I have traveled to on many different occasions since 1992. In 1999 I founded LifeNets, a non-profit organization devoted to helping needy people in practical ways and helping them become self-sufficient. Our website tells the story of this work at www.lifenets.org. I am married to the former Beverly Skogen. We have three children, Kim of Budd Lake, New Jersey, Kevin of Pine Island, Minnesota who married the former Roclynne Ueberschaer and Michael Kubik who married the former Alix Rhodes on January 7, 2003. They live in Whitestown, Indiana. My hobbies and pastimes include working with computers and new software. I enjoy playing the piano and bicycling, and hiking. I have been a member of Rotary Club since December 1999. Through the Web my desire is to network with members and ministers to effectively further the Gospel and fulfill the Commission of Matthew 28:18-20.